Blossom-end rot begins as small tan, water soaked lesions on the blossom end of the fruit. The lesion enlarges and becomes sunken, dark, and leathery. On peppers, the lesion is more commonly found on the side of the fruit towards the blossom end. Also, on peppers it can be sometimes confused with sun scald. 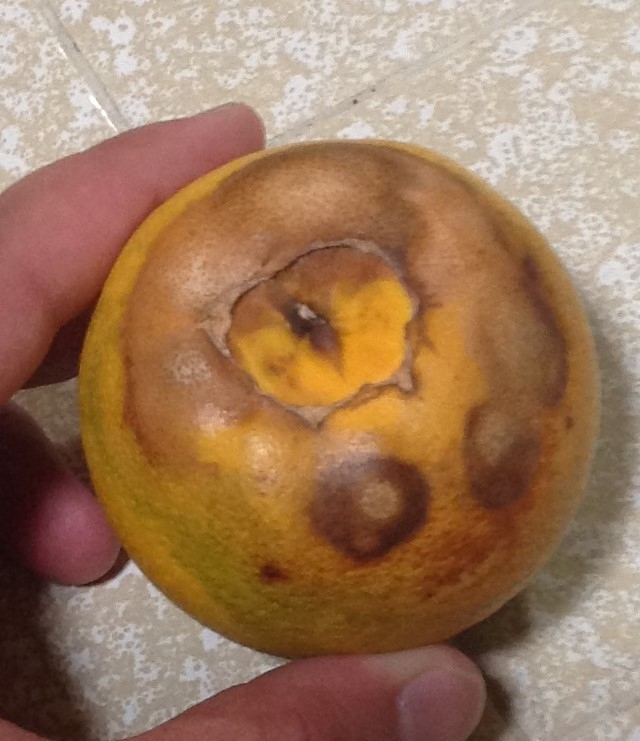 Fruit infected by blossom-end rot ripen often become infected with secondary organisms such as Alternaria spp (most likely the surrounding tissue in the photo below). This is a physiological disorder of low calcium in the fruit. Calcium is required for normal cell growth and in relatively high concentration for new tissue growth. Rapidly growing fruit will begin to breakdown at the blossom end because that is the last place of the fruit tissue to receive calcium and also the area with the lowest concentration of calcium. In rapidly growing plants, calcium cannot move to those rapidly growing areas quickly enough. Because calcium moves with water, fluctuations in water supply can cause blossom-end rot. Large fluctuations in soil moisture inhibit uptake and movement of calcium within the plant. Excessive nitrogen promotes rapid plant growth, which can cause low concentrations of calcium to occur in plant tissue. Leaf tissue can often not disclose a low calcium in fruit because of the lag in movement of calcium to the rapidly growing fruit tissue. Other causes such as low calcium levels in the soil or high amounts of cations in the soil which compete with calcium uptake can also cause blossom-end rot. This is especially true in areas of soils derived from serpentine rock that are high in magnesium. The magnesium competes with calcium uptake. Proper fertilization and water management help to minimize this problem. Avoid over fertilizing the crop. Also avoid allowing the soil to become too dry and then overly wet. Wide fluctuations in soil moisture inhibit calcium uptake and movement. If calcium is deficient or high salts occur in the soil, gypsum applications can help, but delayed uptake may not help fruit tissue content. Often, foliar applications of calcium may be beneficial.